Our vision is to create sophisticated platform technologies that detect disease much earlier than currently possible. 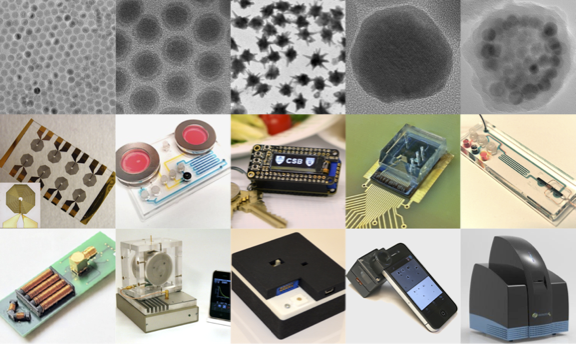 We integrate core concepts in nanomaterials, biophysics, electronics, and computation with a thorough understanding of underlying sensing mechanisms, to arrive at robust engineering solutions. In all, we have advanced various new sensors optimized for specific medical or research needs, many of which have been tested in clinical trials and commercialized. Characterization of single microvesicles in plasma from glioblastoma patients. 2018-08-23: Hsing-Ying Lin (Lee Lab) has been selected to receive a MGH ECOR Fund for Medical Discovery (FMD) Postdoctoral Fellowship Award. Congratulations! 2018-04-11: CSB work is featured on the MGH Blog.